Seif El Rashidi in Art & Photography on 31 October, 2010. It’s not surprising that artists who come up with something novel get the most attention – Christo’s wrapped-up buildings, or Tracy Emin’s unmade bed immediately spring to mind. Those two may puzzle us, challenge us, even lead us into discussions, like those on these pages, about the nature of art. But while we can mull over the artistic value of wacky ideas the truth is that they’ve been leading us to say “Oh, wow!” for longer than you’d think. This “Oh, wow!” comes in several guises: there’s the “Oh,wow, who’d have ever thought of carving columns to look like human figures” (the Erectheum at the Parthenon in Athens [497 BC], or stacking several stone mastabas to form a pyramid [Saqqara, 2500 BC]). And there’s the other “Oh, wow!” of things we’ve never seen before – Charlemagne and the elephant or Durer’s rhinoceros. If those two animals are anything to go by, we can rest assured that any time a traveller shows up with something unfamiliar, somebody with a chisel, a paint brush, or a woodblock is going to get inspired. The pineapple soon becomes a sensation and the centrepiece of royal and noble banquets – its unusual appearance, somewhat unbelievable, making it the horticultural duck-billed platypus of its day. Because it proves impossible to grow in England, it stays rare and pricey and therefore comes to symbolise wealth, and, being consumable, hospitality. Predictably, it becomes the object of the artist’s gaze. And it isn’t just a passing fad. By the seventeenth century, the fruit appears in the work of craftsmen who’ve probably never even seen a real one, above the doors of fancy mansions, in plaster and wood. As it’s still an “Oh, wow!” for the bourgeois couple who can’t afford to serve one at the dinner table, somebody comes up with a cheaper option: pineapples for rent – to display as the centrepiece of your table. The pineapple story here begins in 1644, when a bibliophile preacher with connections to the city, John Cosin, ends up in Paris, in quasi-self-imposed exile. (He travels light, leaving behind him 1000 books, including a now well-travelled copy of a certain Mr. William Shakespeare’s Comedies, Histories, & Tragedies, also known as the First Folio.) Cosin has time to explore the French capital –then still bereft of wide tree-lined avenues, triumphal arches, and steel towers, but not of libraries. Another clergyman, Cardinal Mazarin, has just founded the first public “bibliotheque” the year before. And luckily for Cosin, he’s not the only Englishman in exile – there’s another family there, that of Charles I. Cosin is at least an acquaintance, if not a friend – master of ceremonies, for example, at the coronation of the ill-fated king, some 20 years before. He becomes a preacher to the exiled court. It is a long sojourn for all, but in 1660, Charles II is on the throne, and John Cosin is sent back to Durham – this time as bishop. He is in the king’s favour of course, wealthy, powerful, and there is a lot to be done. The Palatinate city is just a bit too close to Scotland, and looks a bit ragged post-Civil War, having been used by Cromwell during his clashes with the Scots. So the bishop takes a look around his domains, and calls up some carpenters to undo the damage. The Castle, for example, is badly equipped for a grand entrance into dinner and regal Harry Potter-style “flying” staircases are in. By 1664 there are three flights, a hundred or so steps high and Durer’s rhinoceros might just make it up there without brushing by the handrail. Very fetching. But there’s just one thing missing, to give it a little flair – you guessed: pineapples. They may look a bit like pine-cones and we’re not really sure if they lost their leaves, or somebody left them out – but they’re there, as the centrepiece of a wooden fruit-bowl on the post at every turn. With an enthusiastic dinner guest staying on floor three, that would be a possible 36 “Oh, wows”. Not bad. Just in case, Cosin also builds a Paris-style library next door. In fact, the Durham Prince Bishops had a long tradition of making sure they impressed people with what they did. They used architecture to reflect God’s glory, to honour St. Cuthbert, and to make a statement about their own status as well. In the eleventh century, for example, when building the Cathedral, they made sure it was exactly the same length as the mother church in Rome. And it wasn’t just about being “as good as”, or “as unusual as” other things they had seen. In the fourteenth century, Bishop Hatfield purposely built his throne in the Cathedral higher than that of the Pope. Nor was it solely about wanting to compete – it was about creating a sense of wonder as well. A sixteenth-century account written by a Durham monk tells us that of all the treasures given to St. Cuthbert’s Shrine, only the most exotic were on permanent public display: elephant tusks and narwhal horns (the latter thought to be those of unicorns). Back to the pineapple, Cosin is not the only one of our little party of exiled Englishmen who ends up with the fruit to his name. In 1675, the royal gardener manages to grow one, and presents it to the king. Because it’s such a big deal, the 17th century version of a court photographer is summoned (Hendrick Danckerts, a painter, who just happens to be Dutch). So the pineapple, Charles II, and the gardener – ironically named John Rose – are captured in this Oh, Wow! moment for posterity. But just because a royal gardener managed to grow a pineapple doesn’t mean anyone else can. It takes forty-five more years, and two more Dutchmen to develop a hot-house warm enough in Britain, and to celebrate: another portrait, but only of the pineapple this time. Portraits tend to be rather small though, as are pineapples on the stairs… If you were going to like pineapples, you might as well do it in style. Dunmore, Scotland, sometime after 1777: John, the 4th Earl of Dunmore, is the man for this. He decides to settle it once and for all. 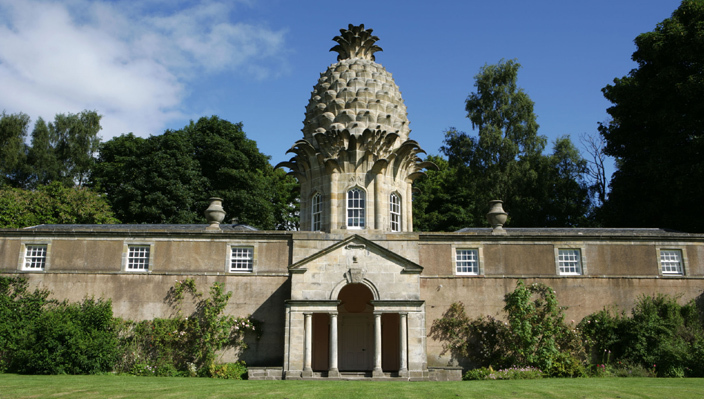 His artistic creation is a garden pavilion topped by a massive stone pineapple, fourteen metres tall. It’s a major Oh, wow! but on a student budget, the price-tag to buy it is probably too high. At least it’s for rent though, but the snag is that it only takes four!